﻿ Sword World 2.0: Big Things come in Small Packages - J-RPG Blog! So I picked up SW2.0 last year, excited because not only was it a remake of the classic Japanese original RPG "Sword World", but because my friend Kitazawa Kei was the "man with the plan" working on it as the primary author. Unfortunately, I don't have my original copy of Sword World to compare the versions, I just have my memories of it from reading/playing it some 13 years ago (wow, it's been that long?). Form: The game is in the "bunko" size of traditional Japanese books/novels, a size about 5 3/4 by 4 1/4 inches (14.7 x 10.5 cm) and 394 pages. The pages are thin and soft as per normal Japanese books, illustrations are sparse, and the book simply feels really compact and tight. You can (and I have) stuff this book in your pocket and barely feel its presence. If it were re-laid out in an 8.5x11 or A4 size, it would probably amount to about 70-80 pages. The font is small but not eye-straining. The few illustrations they have (mostly character races/classes and monsters) are rather excellent B&W pieces. The book is split into three books, only the first (at a price of a little less than 1000 yen, or $10, including all taxes) is commented on here. The second and third books are totally optional, and simply follow the characters and their ability chains into higher levels. Setting: The setting of the game is a western-fantasy world called Rakshia. There are some minor details on the Gods and countries, but it takes up about 10 pages before it flows into more useful info like scenario hooks, GM prep and the like. It's obvious that you're simply supposed to read some light novels or manga, or watch some fantasy anime and wing the details. The setting mostly comes shining from behind the character classes and races that appear in the game: Races like Grassrunners (like hobbit-druids but cooler), Nightmares (human-demon half-breeds), Runefolk (robotic personalities in magically constructed humanoid bodies), Tabbit (the "furry" race, they look like giant sentient rabbits)and of course the typical humans, elves and dwarves. Characters: The races are mentioned above. The classes include all the typical you'd find in D&D or other fantasy games with the addition of the Grappler (kung fu artist), Sage (learned individual) and Magitech (using ancient technology to power-up magical rifles for various effects). So the interesting thing about SW2.0 is that it uses the imadoki/modern style of Japanese RPG development, in which you are presented with several classes and are expected to choose from multiple classes rather than simply choose and level up with one single class. For example, to compare with Alshard (another game that is meant for the same audience: new RPGers who come from a console RPG background, with a similar "choose '3 levels' worth of classes, and go!" methodology), most characters will consist of about 3-4 levels' worth of character at the beginning: Grappler 2/Conjurer 1; Magitech 2/Shooter 1/Sage 1; Fighter 2/Scout 1/Ranger 1, etc. Unlike Alshard, though, all classes are not equal: In Alshard, you simply choose three levels' worth of classes ("Samurai 2, Vagrant 1") to make your character, and all your abilities are based on which classes you pick. In SW2.0, however, some classes are simply more powerful than others (basically the ones that strongly concentrate on fighting or magic). To that end, there are 2 "class groups": Class A (stronger) and Class B (weaker). When you create a character, you will be awarded one free level (usually of a random A class, which you can then decide to specialize in, or choose another focus), and given a small pool of XP with which to level up your character with your Class A and Class B choices. Because of the way character levels and XP work, no matter which way you work it, you won't be able to take one single A-Class and rank it up without taking a B-Class as well: You'll do the simple math and find yourself left with 500-1000XP unspent, which is a perfect amount with which to take 1-2 B-Classes at Level 1 each. Class A character classes are: Fighter, Grappler, Sorcerer, Conjurer, Priest, Fairy-Tamer, Magitech. Class B character classes are: Fencer, Shooter, Scout, Ranger, Sage. The actual making of a character is pretty cool, and again a little outside of the imadoki style of "pick some classes, and that determines everything" (not *bad* at all, just a little different, and definitely a nod to the old school). You have a combination of randomness, choice and more randomness. You pick the race you want to play. Each race has a 2-12 chart you roll on to determine (for that race) your starting class, bascailly your "lifepath": What you did before you decided to become an adventurer. The rules say you can also simply choose what you want, which is good. This lifepath gives you one free level of a particular class, it gives you some starting XP to buy other classes, and finally it tells you your starting "core abilities" of Skill, Body and Heart/Mind (I'll just say Heart). For example, if I pick a Dwarf and roll a 5 or 6 (or simply choose that column), I used to be a Knight. My pick class is Fighter at level 1. My abilities are Skill 4, Body 11, Heart 5, and I have 2000xp to spend on other classes. If I were to have picked (or rolled) Rifleman, I'd have a starting class of Shooter, Have S8/B8/H6, and 2500xp. It's kinda cool that these tables are focused for each race, and different between races: The human Soldier starts out with Fighter 1, slightly different attribute set of S6/B10/H4, and 2000xp. Each race grants an additional special ability as well, specific to that race. After that comes Random Attribute Roll time. This is cool, how it mixes a bit of choice and randomness together. You have these three... best way to describe them is "proto-attributes" labeled A-F, which you roll for based on race. Humans roll 2d6 for each. Others may have abilities ranging from 1d to 2d+6. From there, you find your abilities by combining the letter with one of the core attributes: Your combat rating is equal to Skill plus the "A" attribute. Muscle is equal to Body plus the "C" attribute. Hit points/Life is the total of Body plus the "D" attribute. Rather clever. If you want to reroll your attributes, you can with the GM's permission, but you have to reroll *all* of them, not just the Low One. Picking one special combat power. Re "combat power": kinda like a feat in D&D 3e, but there's only about 16 of them. Very focused. Everything from "lower critical hit number by one" to "never critically fumble and hit a friend with a missile weapon" to "get additional defense ability in combat". It's actually rather hard to choose one, since most of them are actually useful, and not "a laundry list of abilities where you'd be stupid to NOT take the 2-3 "good" ones". If you're stuck, they give a recommendation for each class. Some have two recs, like the Shooter: "Do you want to shoot two guns at once? Pick X; Do you want to always be able to fire into a combat area? Pick Y". The simple "question" nature of the recommendations are nice. At that point, you're pretty much ready to go. Simple, pure, streamlined, but not totally "fast". Looking at the above, it looks like you can crank out characters in 2 minutes. Well, you probably could given the recommendations and the like. However, there's enough choice involved, and solid choice, that you can get stuck trying to make some choices (in a good way), increasing character generation to 10 minutes or so. Just got my SW2.0 rulebooks. I've only glanced over them so far, but I would like to point out that while most of the material in the second and third books are for progressively higher-level play, some of it is more general. The second book adds two races: the Lildraken dragon-people, and the Grassrunner halfling-equivalents. There is also a rather disappointing page on cross-race characters which basically says to pick one of the parent races and go with it. It also adds two category B classes: the self-buffing Enhancer, and the Bard. The third book adds one category B class: the Rider, which is geared towards mounted combat. Amusingly enough, the mount list not only includes the standard array of mundane and fantastic creatures, but also magitech motorcycles. My impression of the setting is that it is a fairly standard fantasy setting, with a history of advanced civilizations being destroyed to provide adventurers with convenient monster-infested ruins and long-lost treasures. To a certain extent I feel that the Runefolk and magitech are pushing the genre boundaries a bit too far in the science-fiction or steampunk direction, but this seems to be an increasingly common trend in modern gaming. I do like how the system mechanics appear to work, and the giant table for producing a more interesting spread of numbers out of 2d6 rolls is an impressive workaround for a lack of polyhedral dice. After continued study of the rules, SW2.0 appears to function much more like a skill-based system than my initial impression, given the class naming. Rather than classes, they feel like skills or sets of related skills that just happen to be bought with experience points. Fighter, for example, covers accuracy, damage, and evasion in melee combat, while Ranger covers a variety of wilderness survival skills but no combat at all. In a more traditional class-based system, one might expect a Priest class to at least be able to hit the enemy with a stick if he runs out of magic, but in SW2.0 "Priest" only covers casting holy magic, and a player who wants a backup option will have to take levels in a combat class. This, to my mind, is exactly how a skill-based system works. A few elements of the system are calculated from the "adventurer level" of the character, which is the highest level he has in a single class, but the vast majority are based solely on the relevant stat + level of the class with the ability being used. The end result is a system where player character growth is a steady progression of small improvements, rather than drastic increases all-around at extended intervals. At the end of every game session the characters gain experience points, even if they have failed to achieve the primary goal, and one stat is improved (chosen from two randomly-selected stats). I rather like how this works. Sort of an "Even if you don't win, you learn from your mistakes" kind of thing. The act of breaking the natural cycle of life and death introduces impurities into the soul, which have disturbing physiological manifestations (Nightmare characters are born with impurities). Depending on the accumulated level of impurity, this can range from minor physical deformation to coming back as a ravening undead. An acceptable risk for a player character, but prohibitively undesirable for even rich and powerful NPCs. I picked up SW 2.0 a few weeks back. I'd actually picked up the original and 2 source books just after I got to Japan in September (for psudo nostalgia purposes), and jumped on 2.0 when I saw the price. My Japanese still isn't up to part (I don't think at least), and I'm currently too distracted by school to try and read/translate anything. Hopefully next year. I'd love to learn more about the game though (and maybe even get in a game or two). My initial feedback, based on a few flip throughs. The book looks easy to read. As opposed to the original, which is almost indistinguishable from a novel, 2.0 looks like a gaming book. The use of headers and diagrams (as well as images) makes the book very easy to follow. I really get the feeling that I could just grab it, start reading, and have a very easy time learning how to play. I also LOVE the small format of these Japanese gaming books (also seen GURPS and several other games in this small size). Every gamer has probably gotten shorter hauling large format books around. This is not the case with SW and similar books. I could easily though the book (and others) into a small bag, toss in a few sets of dice and any other accessories I need, and pack the light load to my game. This is something I just couldn't do back in Canada, where most games come in Hard Cover, several hundred page volumes with at least a half dozen essential sourcebooks. The size of SW is very gamer and space friendly. I finally broke down and bought this ('cause, hey, 900 yen), and have been making characters non-stop for hours - that's usually a sign that a game has grabbed me to some extent or another. Generic fantasy with some interesting new races, a neat way of doing classes, and a tidy-looking resolution mechanic? Yes, please! I also agree with everyone about the format - I love that I can stow the book in my shoulder bag and read it on the bus without having to stick my elbow in the guy beside me. As for kirisame's comments about class vs. skill, that's pretty much how I'm seeing it as well. I'd probably go so far as to translate "fighter", "fencer" and so on as Abilities or Skills (but man, there are a lot of terms floating around in the game that could be translated as "skill") rather than Classes. Okay, I have no idea why I spent so much money importing SW2.0 books, but I may as well write about them since I've got them. I've only glanced over them so this isn't going to be in great detail. Annoyingly, they're all in the larger Japanese B5 size, so they're not nearly as convenient as the main books. The majority of the pages in these books are occupied by comprehensive listings of data that had previously been split across the three primary rulebooks, which makes me feel like I spent a lot of money on reprintings of stuff I already had. Alchemist Works covers items and equipment, while Barbarous Tales cover monsters. There is a small amount of player material in each: Alchemist Works has a new Alchemist class(B) who generates effects by using consumable cards harvested from monsters, and Barbarous Tales has player races for Drake, Dark Troll, Lamia, Lycanthrope, and Kobold. Alchemist Works also has short discussions of each of the classes and dieties from the main books, as well as a list of possible civilian skills and manufacturing rules for creating items from monster drops. Barbarous Tales also has a half-dozen sample arranged combat situations with small maps and random monster tables. Flowcharts and random tables everywhere. I believe them when they say you can play these things without a DM, there are so many tables and instructions. Even the map layouts seem to be predefined sections randomly arranged on a grid. The tables appear to scale for small and large parties of varying strengths. Mist Castle takes place in a monster-controlled coastal city, while Fairy Garden and Eternal Empire both involve exploring the remnants of ancient civilizations. The districts of Mist Castle and the arrangement of the Fairy Garden are randomly selected from a list, while Eternal Empire instead has small maps for each set of ruins and lets the party upgrade the town they're based in as they progress. Feels a bit like someone was playing too much Monster Hunter before writing that one. These books describe the Luferia and Lios regions of the SW2.0 setting, primarily through the use of adventures set in the area. Each book has a description of the region at the front, followed by a variety of npcs, then a few large adventures and a selection of adventure outlines and hooks for further use. Sweet. From what you can get out of the books, how would you qualify them on the "Must Buy" scale for folks interested in SW? These are rather expensive books, all things considered; it seems like the main factor in price must be printing and manufacturing costs, as each of these larger books costs as much as all three of the little main rulebooks combined. When added to the cost of importing books from Japan, I don't know that any of these are really "must buys". The Alchemist Works and Barbarous Tales supplements are nice to have, and the combined tables and bigger page size make it significantly easier to look up equipment, magic items, gods, and monsters than the main rulebooks, but at the same time it's hard to justify the cost when so much of it seems to be data I already have in the main books. At best, these are items that only a GM should really consider buying, despite having some player rules in them. Mist Castle, Fairy Garden, and Eternal Empire will appeal most to video gamers who are used to random encounters and scripted events. There are even charts to calculate completion percentage! Because so much of the GM's work is scripted out, it is possible to play without a GM as long as enemies in combat can be run in an unbiased fashion, but it's somewhat less entertaining, in the same way a choose your own adventure book loses value if one reads through every page first. Still, a lone gamer with no group can play these campaigns solo if need be. Mist Castle is harder than the others, being the kind of setting where one can get attacked on the way to the grocery store, while Eternal Empire portrays a very Monster Hunter-esque region of distinctly divided adventuring and civilian areas. Fairy Garden resembles a streamlined version of the Mist Castle style. In all cases accomodations are made for resurrection in case of party death (Mist Castle's Frankensteinian Tabbit is the best). Players should have all the main rulebooks in order to play these, and possibly more in the case of Eternal Empire; it appears to reference monsters and equipment from both supplements and both the other campaigns, but it seems like it wouldn't be too hard to substitute other monsters in and ignore things like special mounts in shop listings and such. 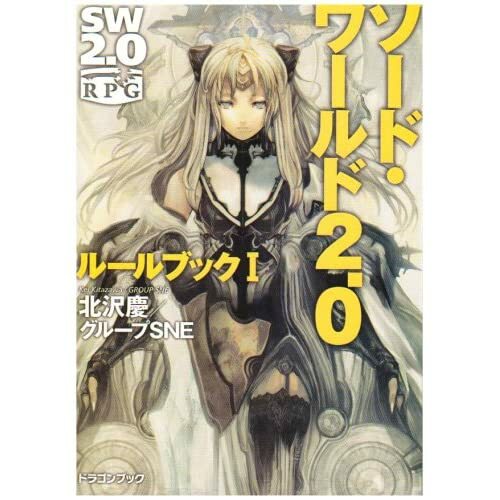 The Luferia and Lios tour guides are obviously most useful to those intending to use the official SW2.0 world, or those who are already familiar with SW2.0 replays and light novels in the official setting. Both books include regional introductions, an array of NPCs, and a variety of adventure hooks in addition to proper adventures. The Luferia guide has three conventional adventures and includes half a dozen premade characters for playing them, while the Lios guide has two adventures in the style of the random campaign books, with flowcharts and scaling encounter tables. The monsters on the Lios encounter tables appear to be chosen such that low-level adventuring can be accomplished with only the first of the main rulebooks, making the Lios guide a good choice for someone who only has rulebook I. Next time I order books from Japan, I'll look into the smaller format SW2.0 books. Looks like there are two scenario books and quite a number of replays and light novels. Once again, I have returned with imported books I probably paid too much for! In the same large format as Alchemist Works and Barbarous Tales, this volume focuses on magic, with a few pages of other things tossed in. As with the previous supplements, a large part of the book is reprints of data that is otherwise spread across multiple previous books, with rules clarifications and balance adjustments. The first half of the book is entirely dedicated to the magic classes. The only rules change to Sorceror and Conjurer appears to be in the rules for familiars, but additional "Wizard" spells have been added that are only available to characters with levels in both classes. Priest gets eight more gods with their requisite diety-specific spells and rules for using holy magic outside a god's region of worship, and building new temples to spread the faith. Fairy Tamer has gotten a complete overhaul, making it even more strongly elemental-based. At each level a Fairy Tamer gains one rank in each of two elements, and elemental spell access is by rank in that elemental rather than Fairy Tamer level. Accordingly, additional elemental spells have been added so there is one of each level for each element, and Fairy Tamer focus gems become more expensive according to rank. The level of complexity involved here is likely to intimidate inexperienced gamers. Magitech has a number of new spells and it has been clarified which spells occupy Magispheres for the entire duration of their effect and which don't. Additionally, purchasable Magisphere "option parts" are available as upgrades for individual spells, which may become a balance issue if players have enough extra money to get spare Magispheres to carry more upgrades. After spells, the book continues with clarifications and ability listings for the classes that learn one ability per level: Enhancer, Bard, Rider (but not Alchemist). The next section is about magic in the context of the Raxia world setting, with half a dozen short story segments. Following that is a rather lengthy collection of magical artifacts with backstories, mostly weaponry. At the end of the book are monster listings for familiars, new fairies, new named monsters, and new mounts (including the ones from the other supplements). I'm not sure I would have added hippopotamus to the mount list, myself. There are no spell indexes in this book, which is unfortunate because now the ones in Alchemist Works are out of date. Both of these are standard bunko-size books, read right-to-left in contrast to the rulebooks and supplements, and with few illustrations. They are intended as starting scenario books for new GMs, and written within the context of a frame story of a hapless student conscripted into a game club, Haruhi-style, with periodic interruptions in the scenario text for conversations explaining how things work. Each book has two connected scenarios and a section on themed scenario creation. The first scenario of each is suitable for starting characters, which means they can be used with the sample characters in the first rulebook. Challenge! is a pair of dungeon-crawls, and the tutorial is appropriately about designing dungeons. Stormfront! is wilderness adventure and a city adventure, with a tutorial on making cities. Also bunko-sized. There are quite a lot of replays available, but this one seemed to be the most stand-alone; the only one not part of a larger series. It covers two adventures, the first involving a highest-level party and a humorously antagonistic GM, and the second with the same members playing a lowest-level party of kobolds. The first adventure was apparently originally serialized in Role & Roll volumes 64 and 65. Interestingly, the artwork in the book is a traditional fantasy art style rather than the more abstract manga style I'd expected. This time I imported my books from bk1.jp instead of Kinokuniya. Good shipping if you can navigate a Japanese website. As seems common with the SW2.0 supplements, while this book is ostensibly focused on the Feidan region of the Telastia continent, there seems to be a lot of unrelated material stuffed in simply because there's not enough to warrant printing another book. There's background on the region as a whole, and then separate sections with descriptions and NPC listings for each of the seven nations in the area, though the Luferia and Lios sections are understandably abbreviated. Aside from the regional data, there are two sections with rules for fighting styles and traps. Fighting styles consist of enhancements of existing combat techniques that can be bought with reputation points. Players must pay for membership in a style, learning special attacks, and sometimes buying specialized equipment. There are 12 styles in the book, most with 3 abilities each, covering physical, magical, and mixed fighting styles. The trap section has rules and descriptions for 38 kinds of traps, random tables, and a sample dungeon to illustrate their use. Also, there are a handful of new items and monsters, including ninja kobolds. Feeling very much like an updated version of Mist Castle, this fourth choose-your-own-adventure random-tables campaign assumes that the player(s) already owns essentially all the previous rulebooks, with the possible exception of Feidan Natural History. As with the previous entries, the encounter tables scale to fit 1-6 players of various levels, and it's scripted enough that a GM is not strictly necessary. It takes place in a section of one of the countries in Feidan that has been sealed off after becoming cursed in a major conflict. The next upcoming books should be a revised Rulebook 1 in July, and a new supplement in August, both of which will include the new combat rules, which will apparently have optional simplified combat in addition to a revised version of the current system. Oh, the official SW2.0 blog says the revised rulebook 1 and August supplement will also have a new Shadow player race; dark-skinned, three-eyed people suited for physical combat. Huh, looking forward to that! Well, bk1.jp apparently merged with honto.jp, but they still pass on the direct shipping cost so I stuck with them for this newest order. I decided I didn't need the revised Rulebook 1 if I was going to get the new supplement anyway, so I ordered that and two more replays. Lots of nice stuff here: 5 new races, 3 classes, a few more dieties, some new equipment, more monsters, the new combat rules, and new indexes to boot. The new races include 3 civilized races: the rather dark-elf-resembling Shadow, the fairy-like Fee, and the translucent crystalline Flowlight. The Fee actually have a different death mechanic than the other races, being reduced to a debilitated fairy form and requiring expensive mana crystals to come back rather than dying as such. The other 2 races are monster races: the runt-like Weakling and the half-vampire Larva. The Weakling is something of a counterpoint to the Nightmare; a humanoid monster instead of a monstrous human. There are actually four subraces to the Weakling indicative of different parent species: Garuda, Basilisk, Merman, and Minotauros. The Larva is, well, a half-vampire and has all the expected traits, including the ability to use its blood on a weapon to do more damage to monsters. The new classes are War Leader, Mystic, and Demon Ruler. War Leader is the first class outside of Scout to be usable for initiative, which is nice. Its abilities are all party buffs by giving orders to allies. It has an interesting mechanic where higher-level orders can't be used immediately, but have to be built up to, so each round the character might switch out the current benefit for a stronger one. Also interesting is the decision to base maximum range for giving orders on total reputation points as a measurement of authority rather than anything inherent to the class. Mystic is based around divination and fortune telling, and all the abilities involve a lot more randomness than those of other classes; effectiveness depends very much on the dice. It also has an interesting mechanic where some of its high-level abilities affect not the game but the meta-game: a successful use of a trap-avoidance ability, for example, rewinds the play to before the trap was sprung and treats the cancelled events as a vision of the future received by the character. Demon Ruler is complex. As with the Fairy Tamer rewrite in Wizard's Tome, Demon Ruler is only appropriate for experienced players. The class has both standard spells and rules for summoning demons and subjugating them within items or other vessels. Amusingly, the rules explicitly point out which spells and which summoning sacrifices are liable to get one arrested on sight in polite company, though I'm not sure why they would be so terrified by a person growing claws or wings when Enhancer already does similar things. Four more dieties and their spells, though one of them is listed as NPC-only. One or two pieces of new SS-rank equipment in most of the categories. A variety of monsters of all levels. New indexes make up for most of the ones in Alchemist Works being out of date now. New combat rules: In addition to having revised versions of all the old combat rules in one place, there are also rules for two simplified forms. The original combat rules are now the Advanced rules, and the new ones are the Simple and Normal rules. Simple rules are basically old-style Final Fantasy combat: front line and back line for either side; front lines in melee with each other and ranged attacks in the back. More specifically, combat is divided into three areas spaced 10m apart from each other and the rules are adjusted to account for the lack of people moving around a lot. The Normal rules play out like an old Tales game, with characters able to move only on a single plane. Essentially, combat takes place along a narrow line instead of on a wide field. The rules are adjusted to account for not being able to go around the side to flank. Once again I have bought only stand-alone replays so as not to commit myself to buying a long series of books. Fairy Force is essentially a demonstration of the Fairy Tamer rewrite from Wizard's Tome; two sessions of mid-level characters all taking Fairy Tamer with different elemental selections and generally acting like a magical girl sentai team. Barbarous Royal serves a similar purpose for the monster races from Barbarous Tales; three sessions of mid-level characters all monster races. Oops, completely wasn't paying attention and another regional supplement is out; time to order Player's Handbook: Zaltz Natural History. As expected, this covers the same sort of stuff that the Feidan Natural History book covered. I'm assuming that the Feidan and Zalts regions are the ones most commonly used in replays and novels, which is why the supplements are focusing on them. In addition to the regional data, 12 more styles, and new items, a chapter is also dedicated to adventuring in the southernmost section of the uncivilized northern continent(Zalts is the northernmost part of the main southern continent). This one takes place in the catacombs under Mist Castle, and actually has a few new combat styles for players. Much like Fairy Force and Barbarous Royal, Cardia Carnival is intended to demonstrate the new rules introduced a recent supplement, in this case the Cardia Grace supplement. Two-headed Serpent, meanwhile, is another overpowered adventure with the party from Ruinous Serpent rewritten for the intervening rules updates and supplements. They continue to amusingly roll over impossibly strong opponents with little effort but get stuck on puzzles that can't be won with dice rolls. In other news, a revised version of the second main rulebook is coming up in July, having been updated to match the changes from later supplements and adding a new caster-focused race. The improved racial abilities from Alchemist Works will also be added to the main rules in this version. New supplement time! I didn't feel like buying the second revised rulebook because the new stuff is also in the new supplement so it would be a little redundant. Four new races: Highman, Miacis, Dark Dwarf, and Vulcan. Highmen are the result of failed human experimentation, having strong magical powers but unfortunately short lifespans. Miacis are the inevitable catpeople (in a setting that allows for android maids in the very first book, it was only a matter of time before catgirls showed up). Dark Dwarves are self-explanatory, and Vulcans are a gargoyle-like race of earth and fire; both showed up previously as NPCs in Mist Grave. Updated lifepaths and starting stats for all the old races, plus extended fluff to match the amount given to the new races in Cardia Grace, which is nice. The big rules changes are for combat techs and the various summon magics. Techs with numbers can now be upgraded on level-up rather than taking up a new slot, so you can replace Cover I with Cover II and Cover III later without having to forego two other slots for them. To that end some of the techs have been renamed to clarify which qualify for upgrading and which don't, and a few more have been added to improve options that had proven too weak from a character optimization standpoint (grappler throws have more upgrade potential now, etc.) There's a rather sizable chart displaying which techs are available at which levels with arrows to indicate prerequisites and progression. To give more variety to summoners, data for a decent number of new golems, fairies, and demons have been added for the conjurers, faerie tamers, and demon rulers respectively. Faerie tamers can now also summon Ancient Fairies (previously unsummonable) by meeting two elemental requirements simultaneously. Alongside these is a rather sizable array of new monsters, supposedly totaling 140+ creature listings, but I didn't bother counting to check.